Keeping Old Glory looking new has been a passion for a Salem drycleaner who helps to make American flags around town look pristine. 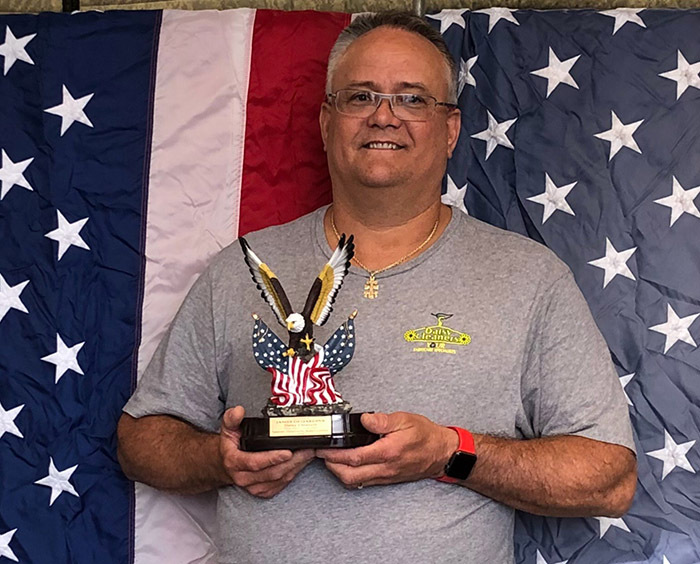 Daisy Cleaners owner, Jim Desjardins, was recognized by the Veterans Association recently for cleaning and restoring salvageable American flags which have been marked for destruction. Doug Micklon of the American Legion Post 63 said the group sought restoration of a meaningful casket flag in poor condition. “We received a flag, it was in a wet bag, it was moldy, it stunk,” he said. “I don’t know how he did it but it was like it just came from the factory,” Micklon added about the cleaning. Proudly wearing an American flag on his sweater, Desjardins accepted a sculpture of a bald eagle and American flag, thanking him for his services. Desjardins' dedication to the flag stems from a personal experience when his father, a veteran, was laid to rest. “They put this wrinkled flag on his coffin and it bothered me,” he said. That experience pushed him to make sure all veterans in the community can have a wrinkle free flag over their caskets. “Almost every veteran that comes through the cemetery system in the Salem area, those flags come to my store first, and they’re all pressed, no charge, so that they can go out with a distinguished look,” he said. Daisy Cleaners offers complimentary American flag cleaning to anyone in the community as a way to thank veterans for his freedom. “Each and every day we enjoy our freedom,” he said.